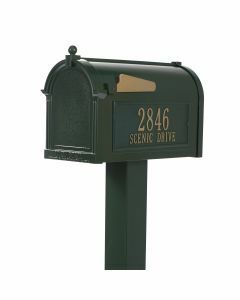 This handsome mail post, featuring a handcrafted base, is as durable as it is stylish, providing proud service no matter the weather, season after season. It is made of northern white cedar and is stained white. The post measures 4 1/2" square x 7' tall and is long enough to allow for up to a 30" burial. The optional Bristol Mailbox is sold separately. The baked-on electrostatic powder coating ensures great look and long life. 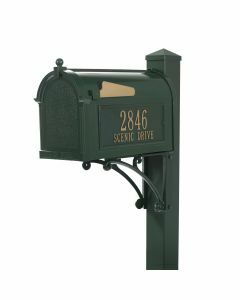 The mailbox is hand fabricated and comes in three colors, Green, Black or White. The mailbox measures 10" high x 8" wide x 21" deep. There is also lettering available for the mailbox. The lettering comes with 1 set of the street name and 1 set of street numbers. The letter is shipped separately separately from mailbox and easily applied by customer. Please make your choices from the drop down menus. If ordering the lettering, please be sure to enter the street number and name exactly as you would like it to appear in the box provided. Click on images for greater detail.